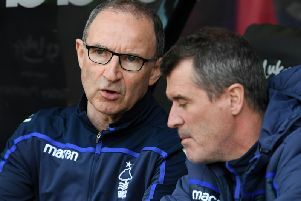 Martin O’Neill got his first win as Nottingham Forest manager on Saturday afternoon after a hard-working 3-1 win over Wigan Athletic at the City Ground. Forest took the lead through a Joe Lolley strike before Josh Windass levelled from range. Second half goals by Matty Cash and Adlene Guedioura gave Forest the victory however to end a run of two successive league defeats. After a cagey opening ten minutes, Wigan were presented with a good opportunity to get the games opening goal as Ben Watson was penalised for handling the ball 25 yards from goal. Reece James stepped up to take the free-kick but he whipped the ball past Costel Pantilimon’s far post. In the 19th minute, Forest took the lead with their first real shot on target. Joe Lolley, who had gone nine games without a goal, created some space outside the Wigan area and dispatched a low, drilled shot into the corner past the dive of Jamie Jones. Wigan were pressing for an equaliser and went close on the half hour mark, Nathan Byrne having too much space the near post to divert Josh Windass’ cross towards goal but thankfully for Forest his headed effort was off target. The Reds couldn’t keep out the visitors for much longer however as in the 33rd minute, the Latics drew level. Windass was involved again as he advanced from midfield and the former Rangers man saw his low shot go under Pantilimon and into the back of the net. Forest almost went back in front instantly after good work by Lolley set up Cash but the Forest winger dragged his shot just past the post. Cash went close again moments later. Daryl Murphy deftly flicked the ball towards the middle of the area where Cash was charging in but his shot was somehow deflected over for a corner. Three minutes into the second half, Cash finally got his goal. Adlene Guedioura unlocked the entire Wigan defence with a stunning, threaded pass to Cash on the right flank and he proceeded to cut inside and beat Jones with a low effort across goal. Wigan looked to bounce back and Pantilimon had to be at his best to deny Cedric Kipre from close range before the Romanian stopper was clattered by James Vaughan when diving to gather a teasing cross. With ten minutes to go, Forest wrapped up the game. Just like he had been for Forest’s first two goals, Wigan ‘keeper Jamie Jones was beaten with a low shot across goal with Adlene Guedioura this time being the man to see his shot nestle into the bottom corner. Within moments of going 3-1 ahead however, Forest gave away a penalty. Reece James’ free-kick struck the woodwork and in the ensuing scramble, a Wigan man was brought down. Joe Garner stepped up to take the spot kick but it was poor and Pantilimon was able to save before getting up to block the rebound.